I feel like I’ve got a good handle on jQuery Mobile event handlers, but I just found myself making a mistake that led to some pretty severe performance issues. Assuming I’m not the only one to screw this up, I thought a good demo of my bug would be helpful. Makes sense, right? However, what if you want something to happen every time a page is shown? The pageinit event fires only when the page is created. If you want to run something everytime a page is displayed, you would use pageshow instead. So far so good. 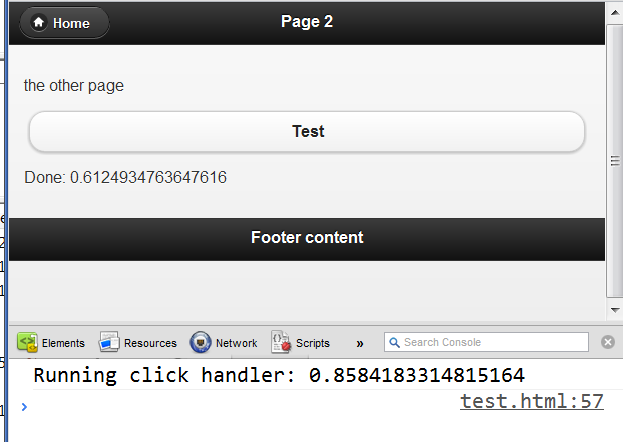 The page also contained a button that, when clicked, would perform an Ajax request. I updated my code to add a click listener. In the code below, I fake an Ajax request by using setTimeout. I now had 2 console messages (plus the original) shown. If I left and came back a few times, it just got worse and worse. What makes this even more evil is that - without the console messages - you can't tell there's a problem at all. What happened though is that another tester ran the application a while and noticed worse and worse performance. The real code was doing an Ajax call retrieving a lot of data. Now imagine that running 8-10 times and the network traffic will grow incredibly. 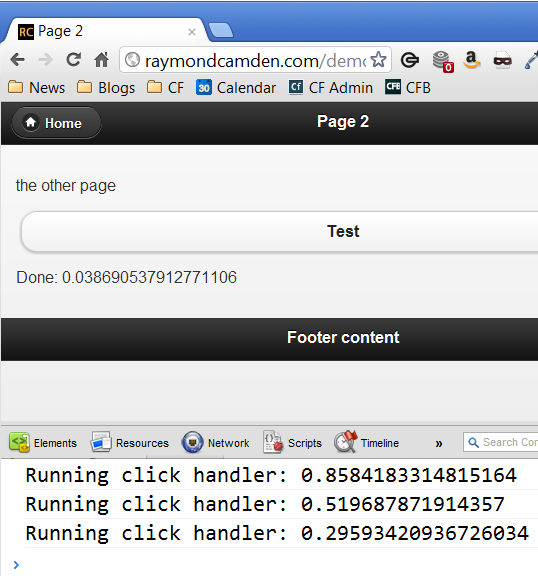 You can demo this yourself here: http://raymondcamden.com/demos/2012/apr/1/test.html. I encourage you to try it without your console being open and see if - like me - you don't see an issue. Then open your console and the bug should then be obvious.